This has been a dirty week. I’m sorry. That’s the truth. Monday began slowly but it had a strong collapse from a cool thirty degrees celsius to a raging thunderstorm before noon on Wednesday and the howling, pounding rain smacked the ground with puddles and smatters of muddy, dirty, you-name-it (you stepped in it), only to return again and again. Several hours after dusk, the first few nights were filled with drenched rains and dense humidity. Interestingly, the last two days were a grand turn from wet and musty to parched Earth and gorgeous light. What is it about a beautiful day? Sometimes it appears on the weekends, but then other times it interrupts you. It appears. Where are you? Indoors staring at the white walls of your research lab, otherwise known as the office. Confession. My research is not equal to stem cell discoveries and chemistry beakers. Instead it is the truly vilifying nonsense of internet surfing, .pdf analysis and fact-checking which is more tedious than my Masters professors may have had me believe when I signed on to the exciting task of dissertation-writing. Composition is meant to be creative, intellectual work but academia is just tiring when it comes to deadlines. Ask Calvin. Do you have fun when you are indoors? 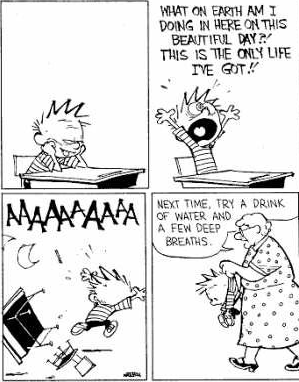 Calvin often asks the question many adults would like to say but are loathe to admit because of the demands of a normalized work week. Why this assignment? Why do we have deadlines? Naturally, these are rhetorical questions most socially-aware adults would merely think rather than utter out loud. On this gorgeous day, it got me thinking. Maybe I am no longer capable of thinking the “six impossible things before breakfast” that Lewis Carroll bragged he could daydream about, but I can still set aside the curtain of the window. Maybe I can remember how lovely the day is. While the rain has some strange weight that makes my heart heavy, it is magically lifted when the sun appears again. My father is a great example when it comes to prioritizing the day. He loves to work and in fact, often ends up focused on more than three projects at a time in less than twenty-four hours but he always, always gets it done. Of all the people I know, Dad would be the one to remind us to get outside and play when we were kids. He knew the value of ‘Work hard, play hard.’ I may not be a kid anymore but there is something that makes me smile about seeing the sunshine even if I’m not in it. How do you prioritize a beautiful day? Do you stop to notice it? I’m carefree even if just for a moment. It may be Winter where you are but it is Summer in AFRICA. Happy Friday!